Lifters have been using eccentric-focused training as an overload technique for decades. But recent science has given greater insight into why this works, and how to make it work best. Here's what you need to know! I&apos;ve heard the eccentric phase of a lift is really important for growth. 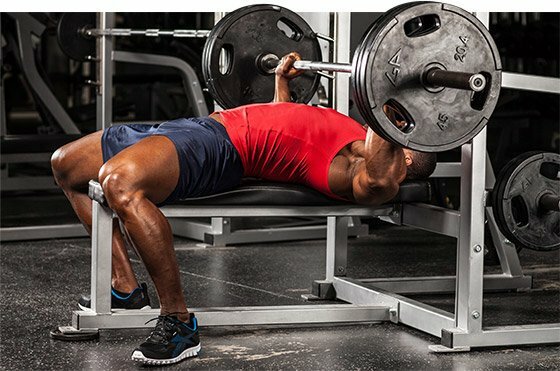 Should I slow the eccentric portion of the lift as much as possible to increase muscle mass and bust out of my plateau? Ever since I was a teenager, I&apos;ve been studying skeletal muscle growth. After decade or so, a PhD, and plenty of academic studies later, I can confidently say that scientists have still only scratched the surface as to what makes this elaborate process work. Conversely, they can&apos;t say exactly what causes it to stop working, even though you are still training like you were when it was working. Luckily, we learn more all the time. We know more than ever about the mechanisms which seem to be responsible for causing individuals to "plateau" when they were previously able to make gains so readily. Specifically, we&apos;re pretty sure it has a lot to do with a type of cell in our body known as satellite cells. These little growth bombs are ready and waiting in your body right now. I&apos;m going to tell you how you can activate them through optimal eccentric loading, but also why it&apos;s not a good idea to make the eccentric phase of your lifts longer than just a few seconds. As many of you know, there are two active parts to a lift: the concentric (or lifting) phase, and the eccentric (or lowering) phase. Both phases trigger muscle growth, but sometimes they do it through different mechanisms; I discussed the four mechanisms in my Mass Class training article. There are two active parts to a lift: the concentric (or lifting) phase, and the eccentric (or lowering) phase. My lab group recently conducted a study where we found that simply bathing muscle cells in phosphatidic acid made them increase in protein synthesis.4 To answer your next question: Yes, we also found that taking supplemental phosphatidic acid increased muscle growth. The result is increased muscle fiber size and the addition of the satellite cell&apos;s nucleus to the muscle. The latter step is critical, because the nuclei in the muscle are primarily responsible for stimulating skeletal muscle protein synthesis and growth. The more nuclei you have, the greater your growth potential. Sounds important, right? Sure enough, research has shown that individuals who plateau in their training can&apos;t adequately activate satellite cells.6,7 To tap into this critical cell population for growth you have to maximize eccentric loading. So let&apos;s get into how you can do that. Research shows that faster speed eccentric contractions result in a release of more growth factors, more satellite cells, and greater protein synthesis than slow speed eccentric contractions. Once people learn the growth power of eccentrics, their next step is often to slow the eccentric phase down as much as possible—sometimes 5 seconds or more—in hopes that it will lead to more growth. While this is logical, it actually doesn&apos;t pan out. Research shows that faster speed eccentric contractions result in a release of more growth factors, more satellite cells, and greater protein synthesis than slow speed eccentric contractions.8,9 Seems shocking but it&apos;s true. Let me explain. As many of you know, muscle tension occurs when the contractile proteins myosin and actin bind to each other or form what&apos;s known as a "cross-bridge." The more cross-bridges you utilize, the less tension any one cross-bridge will have to bear—and the lower the muscle damage will be. The major downfall to slowing down your contractions to emphasize the eccentric contraction is that your body has more time to form cross-bridges. The result is less damage, lower protein synthesis and ultimately growth. Thus, my advice is to control the eccentric contraction but not to slow it down much. If you are training arms, for example, take no more than 1-3 seconds to lower the weight. You may have heard that you&apos;re stronger eccentrically than you can concentrically. It&apos;s a great principle to know. So are you putting it into action? Thus, if you emphasize the eccentric contraction with the same weight you use for concentric contractions, you probably won&apos;t see any added benefit over the concentric contraction. You have to go heavier! There are a number of ways to increase the eccentric load. The classic method is to use assisted negative reps, where you lift the weight yourself, and on the way down your partner presses down on the weight. A second way is to lift a weight with two limbs and lower it with one. For example, if you&apos;re doing hamstring curls with two legs on the way up, you can lower with only one leg. If all this talk about muscle damage has been enough to make you start feeling preemptive DOMS, you&apos;re on the right track. This is advanced training material, and it&apos;s not right for everybody. And even if it&apos;s right for you, it&apos;s not right all the time. So let&apos;s recap and get your expectations in line. A major reason plateaus are reached is because individuals no longer are able to activate satellite cells. These cell appears to be activated through overloading the eccentric portion of the lift. In order to overload on the eccentric portion of the lift, use a controlled but relatively short eccentric phase of a lift, like 1-3 seconds maximum. Anything longer may hinder muscle damage and subsequent growth. Finally, assisted negative repetitions can optimize protein synthesis and muscle growth. However, it&apos;s crucial that you periodize this method, because it will lead to substantial muscle damage. Utilize it no more than once per week for the body part that needs the most work. Yasuda T, et al. Effects of blood flow restricted low-intensity concentric or eccentric training on muscle size and strength. PLoS One. 2012;7(12):e52843. Eliasson J, et al. Maximal lengthening contractions increase p70 S6 kinase phosphorylation in human skeletal muscle in the absence of nutritional supply. Am J Physiol Endocrinol Metab. 2006 Dec;291(6):E1197-205. O&apos;Neil TK, et al. The role of phosphoinositide 3-kinase and phosphatidic acid in the regulation of mammalian target of rapamycin following eccentric contractions. J Physiol. 2009 Jul 15;587(Pt 14):3691-701. Rosenblatt JD, et al. Satellite cell activity is required for hypertrophy of overloaded adult rat muscle. Muscle Nerve. 1994 Jun;17(6):608-13. Bamman MM, et al. Cluster analysis tests the importance of myogenic gene expression during myofiber hypertrophy in humans. J Appl Physiol (1985). 2007 Jun;102(6):2232-9. Petrella JK, et al. Potent myofiber hypertrophy during resistance training in humans is associated with satellite cell-mediated myonuclear addition: a cluster analysis. J Appl Physiol (1985). 2008 Jun;104(6):1736-42. Moore DR, et al. Myofibrillar and collagen protein synthesis in human skeletal muscle in young men after maximal shortening and lengthening contractions. Am J Physiol Endocrinol Metab. 2005 Jun;288(6):E1153-9. Shepstone TN, et al. Short-term high- vs. low-velocity isokinetic lengthening training results in greater hypertrophy of the elbow flexors in young men. J Appl Physiol (1985). 2005 May;98(5):1768-76. Mayhew TP, et al. Muscular adaptation to concentric and eccentric exercise at equal power levels. Med Sci Sports Exerc. 1995 Jun;27(6):868-73.